In my December 2012 post, “The Pre-war Japanese Community in Singapore”, I mentioned that after the Japanese Imperial Army surrendered to the victorious Allied forces in Singapore in 1945, virtually all the Japanese residents there were repatriated to Japan together with the armed forces personnel excepting those who were being charged with war crimes. Most of the Singaporean women who married Japanese husbands were not allowed to accompany their spouses. Monica Choon, an executive with a leading Singapore travel agency was a child of a Japanese army civilian technician and a local Chinese mother. She never knew her father as she was born only one month before the war ended in Singapore in 1945. Her mother, Madam Tham Chee Fong, raised Monica as a single parent and gave her the surname Choon, which was the transliteration for her father’s surname Murai, because of the intense local hatred against the Japanese for their cruelties inflicted on the local Chinese community after they conquered Singapore. Madam Tham owned a cafe in Great World Amusement Park, which was popular with both local and Japanese personnel. Mr Murai was one of them. They fell in love and married, despite apprehensions of Madam Tham’s family members. The married couple lived with Madam Tham’s family in Gullimard with many Malay neighbours until the war ended. When Mr Murai failed to come home for a couple of days, Madam Tham was worried what could have happened to him. Only after much inquiries and several days later that she finally ascertained that her husband had been detained by the Japanese army in an army camp pending his repatriation to Japan shortly. She was not allowed to see him and had not seen him again. Madam Tham subsequently sent numerous letters to her husband’s Hokkaido home address but these were returned to her unopened. Neither did she hear from him ever since. 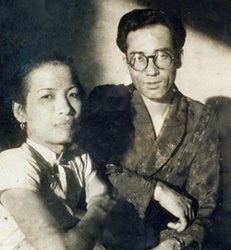 Madam Tham was convinced that her husband’s very strict and conservative parents had prevented their son from communicating with his Chinese wife as they were firmly opposed to his marrying a foreigner. From what Monica knew of her absentee father from her mother, he was a devoted husband, a doting father and a very decent and helpful person. He was also handsome and got on well with her mother’s family members and relatives. He was a six-footer and his external features were not typically Japanese. He was kind to their neighbours and would share his special government ration of rice, sugar and cooking oil with them. These daily necessities were in acute shortage and much sought after at inflated black-market prices. Monica’s mother died in 1981 at the age of 61. Before her death, she had urged her daughter to make every effort to find her father and, if she succeeded, to be filial and to look after him. Monica started to search for her father from the 1960s onwards. She first approached the local Japanese Embassy and drew an unhelpful response that as there were many such cases like hers, they were unable to assist her. She then resorted to other ways of locating her dad but also without success. She finally met a sympathetic Japanese pilot who agreed to help her. His efforts were not in vain. He found the records of one Murai of Hokkaido, some of whose antecedents corresponded with that of her missing father, and he died in early 1970s. Needless to say, she was shattered by this information but was still hoping that this was a case of mistaken identity as Murai was a fairly common family name there. She then persisted in her efforts to find him until his fate after he left Singapore had been conclusively established. I came to know Monica through work and she looked after my business travels and related needs. She became our family friend well into the present time. Towards the end of 1990s, knowing that I had become a regular contributor to Singapore’s Straits Times newspapers and its sister Chinese language daily, she related to me the story of her parents and asked if I would consider writing a human interest article in the Straits Times which, hopefully, could lead to the whereabouts of her father in Japan. If still alive, he would be 82 years old. I was moved by her filial piety and her doggedness to find her father over such a long span of time. After dinner at my home, and for the next two hours, she related to me the unkind fate of her parents. I was touched and immediately promised to help her. Soon after our above meeting, I emailed my article to my friend, Richard Lim, the supplement editor of Straits Times, hoping that he would run it and be picked up in the Japanese media and finally reaching her dad and/or his family members. Mr Lim was receptive to run my piece in the same week. I was thrilled to see it in print as the week’s Cover Story, with photographs supplied by Monica of her parents and herself, the father’s last known Hokkaido address and Monica’s contact mobile phone number. An unexpected surprise awaited me. One month after the publication of my article, Monica telephoned me and told me excitedly that the Singapore-based Japanese bureau chief of Japan’s Hokkaido Simbun newspaper, Mr Kita Yoshinori, had telephoned her a while ago to break the news that a Japanese man who identified himself as the brother of Mr Murai’s second wife had contacted his paper in Hokkaido and unravelled the mystery of her father. Mr Yoshinori was informed of this and he broke the news to Monica and had arranged for a telephone chat between she and her siblings in Hokkaido the next evening at her place, with him acting as their interpreter. She requested that I be present and write a follow-up article to report on this historic telephone conversation between the two ends of the Murai family. I declined to be present and told her that it would be more appropriate for me to inform Mr Richard Lim of this turn of events for his follow-up action. He was delighted with the news and immediately said that his reporter and a photographer would cover this event at Monica’s apartment. On the eagerly awaited evening, a 45-year old Japanese man, who identified himself as the youngest of Mr Murai’s sons, told Monica that their father married his mother through an arranged marriage by his parents soon after his return from Singapore. They had one daughter and three sons. Mr Murai died in 1972 at the age 56, followed by his wife some years later. Monica then spoke to her 50-year old step-sister. Both the siblings spoke warmly and affectionately to Monica and formally welcomed her as the eldest sister into the Murai family. They both expressed the hope that all the siblings would meet before long in Singapore or in Hokkaido. Monica ended the chat by telling her siblings “to write to her henceforth as Monica Murai and she would no longer use the name Monica Choon”. This tearful and emotion charged family chat lasted more than 45-minutes, with Mr Yoshinori interpreting for them. Thanking me for my help to reunite her with her Japanese roots and to enable her to find out more about her late father, Monica told me that the very next day she made a special trip to Bright Hill Buddhist Temple, where her mother’s ashes were interred, in order to tell her that she had found her loving husband and her doting father and that both her parents should now be happily reunited in the heavenly paradise. Monica was much comforted that her pledge to her mother had been fulfilled even though her father was no longer alive. The face to face meeting between Monica and the youngest of her step-brothers and two other family members took place not long after the above telephone chat. They flew to Singapore specially to attend the wedding dinner of Monica’s eldest daughter at a posh hotel restaurant. Mr Yoshinori and my wife and I were also invited. Monica honoured us by placing us in the bridal table together with her Japanese family members. Mr Yoshinori interpreted for me and these Japanese visitors throughout the pleasant evening. One of the first things that her step-brother said to me was that when he first met Monica at the Singapore airport, her distinctive Murai nose, which he and the other siblings shared, immediately marked her out as a member of his family. In the course of the evening, I found out more about her father’s life in Japan and the rest of his family. Not long after Monica’s Japanese relatives’ visit to Singapore, she reciprocated their gesture by going to Hokkaido and met up with all the siblings and their families there. They received her with genuine warmth and hospitality and one of them invited her to stay at his house and took her to pay her respects to their late father, whose ashes were interred in a Buddhist temple. Although she never knew her dad, she nonetheless felt that she had already got to know him quite intimately from her mother’s account of him. It was both a happy and sad and a tear-flowing occasion for her. Since Monica’s first visit to Hokkaido, she has been visiting her Japanese family members periodically. She very much laments that language barriers have prevented her to truly communicate with them except through their very limited broken English and her own smattering of Japanese and mainly with the help of sign language and body gestures. Monica took up the ancient art of Shiatsu acupoint massage after having experienced its beneficial impact on human body. It has now become her passion and she continues to further advance her skills on it. She returned her siblings’ hospitality and affection by extending to them the soothing and therapeutic Shiatsu massage, whenever she visits them in Hokkaido. She was much gratified and amply rewarded when they praised her masterly of it which is equal to that of a competent Japanese practitioner there. Shiatsu originated in China and the Japanese learnt it from them centuries ago. It has now become almost a lost art in China but still flourishing in Japan. The Murai family saga and Monica’s determination and untiring efforts in finding her father finally and belatedly caught the attention of Singapore’s national television network, Mediacorp, who made a half-hour documentary programme of it about five years ago and broadcast it in both its English and Chinese channels as a prime time programme with Monica herself in the starring role. Even I was featured briefly in it, with a younger and better looking professional actor taking my part in this happy-ending saga. I forwarded your request to Ms Choon by her email address in my record and asked her to contact you by phone if she wants to. I can’t do anything more for you. I am Xue Qiang, a writer who is currently working on a project that aims to collect memories of Singapore’s past through love stories. I am looking for couples to be featured in the project, and stumbled on this story on Ms Monica Choon. I understand that you have tried to communicate with Ms Monica Choon, but failed. Are there other ways that you can help put me in touch with her, such as people you know that may have her contact number in any way. Please feel free to contact me at my number/email below. Hope to hear from you. Thank you! I tried to communicate with Choon but failed. Thank you for this wonderful story, really enjoyed it. I am a producer at a publishing page, Our Grandfather Story (www.facebook.com/ourgrandfatherstory/). I am interested to get in tough with Ms Choon. May I ask if it would be possible to get in touch with you to find out more? I am glad that you like this article, which reminded you of your time in Singapore There are several more other articles among my postings about Singapore , which may also be of interest to you. The direct link to my website is http://www.lampinfoo.com, which has 149 articles to date on various topics. The direct link to my website is http://www.lampinfoo.com. I will appreciate it if you could mention my blog to your relatives and friends who may also have an interest in Singapore then and now. Thanks. A very touching story indeed.